All, I just re-read this blog and the comments (at the encouragement of a friend). Br far this blog and comments is the most interesting of all. In my 4/26/13 update I talk about three other smaller tumers that may or may not have been prestent in my liver… And the bottom line is that I ended up having a successful liver resection after having been declared inoperable. Modern medicine miracle? Or just plain miracle? Well I believe that our Lord is at work. And I THANK YOU all for the countless prayers you have petitioned on my behalf. Day two of this final treatment 12 of 12 is going good. Thank you Lord for another day on this beautiful Earth. God be with you all on this beautiful Friday. 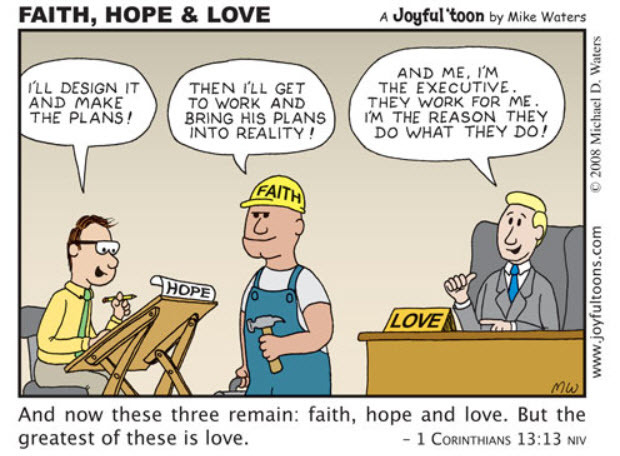 I was doing a little research and found some interesting info on Faith, Hope, and Love. In the last blog update I raised the question “What is the difference between Faith, Hope, and Love?” It seems like this question was contemplated quite some time ago by Martin Luther (who lived from 1483 to 1546). I found an article referencing Luther’s teaching on this subject. The summary of this article is as follows. Essentially Faith is the truth that we hold in our heart and mind. Hope rises in the will, in response to tribulation. Faith anchors us and hope is our guide through despair or tribulation. I thought the statement “By faith we begin, by hope we continue…” is very profound. So, with this I examine how faith and hope applies to me. 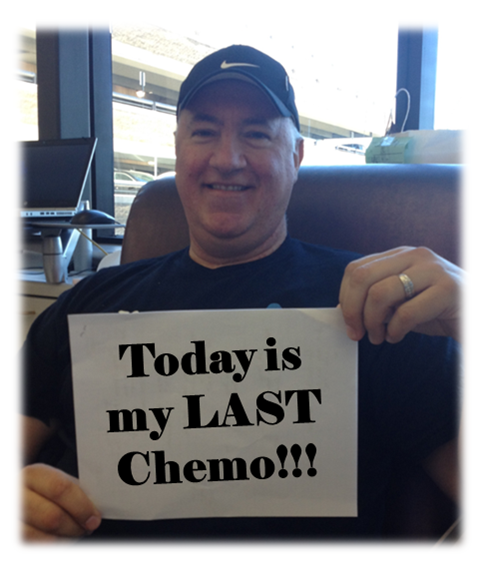 Today is my last chemo treatment. Please “like” this post to show your support in my fight against cancer! I would love to see 100+ likes. If you Like and Share I’m confident that more will join my fight! I started this battle on Halloween 2011. That was 696 days ago (nearly two years). Four surgeries, twenty-two radiation treatments, eleven treatments of FOLFOX and Oxaliplatin, twelve treatments of FOLFIRI and Erbitux, and countless Scans later I finally have a legitimate shot at a FULL REMISSION! Praise and Glory be to God! And thanks to the hundred’s of health professionals who have helped me in my fight. I have been blessed to have skilled surgeons, doctors, and nurses fighting with/for me. I pray that God will bless them and continue enabling them to help me and others BEAT cancer. My CEA level continues to be under 1.0 (this is VERY GOOD). The next step will be scans on 10/23/2013. If the scans are clear my doctor will monitor the CEA level (monthly) and do scanning every two or three months. Our God is good! Our God heals! Thank you Jesus for the countless blessings and abundant love you have bestowed upon me and my family and friends. We know you have a perfect plan for each of us and we trust that your plan will prevail. We pray that you light our path and be our strength in life as we endure the storms that shape who we are. Please “Like” and “Share” this post to join in my prayer and show your support for those people who are fighting against cancer! Dear Lord, Thank you for getting me through day one of the eleventh treatment. Only one more to go after this one!!! As I set here to write a blog update I pray that You will give me the words to share my heart with my brothers and sisters. And that You will be present in my words. Treatment 11 went as usual. My beautiful wife Connie and I were up at 4:30am, on the road by 5:30am and in Ann Arbor for the blood draw at 7am. Since there was not a doctor visit we finished up with the on-site infusion at 3:30pm and were home by 4:45pm. My CEA continues to come in with a <1 score. But the caution from Dr. Krauss echo’s in my mind. We can’t expect that this number will stay under 1 after we stop chemo. And we can’t be overly concerned if it climbs a little. Even if it doubles and doubles again, and reaches out-of-norm levels we will need to remain level-headed and simply look and find what we are dealing with. I do expect this to be a point of anxiety in the future but I will surely try to remain in peace knowing that the Lord will be with me every step of the way. Following Treatment 11 was Bryce’s first football game of the year. I was just telling a few people that I was so happy that his games were on Wednesday’s because that put them in the middle of the treatment cycle. But God reminded us that not all plans work out the way we would hope. The rain storms on Wednesday forced the schools to reschedule the games to Thursday. I was not able to do do the volunteer work I had hoped to do but I was able to attend and watch Marshall win their first game of the seasons. Thank you Jesus for a wonderful evening of Marshall Football and Congratulation Redhawks! My Dad. As I reflect on my faith and the man that I have become I can’t help to reflect on who my father was. I am a very lucky person to have had a father that was strong, generous, kind hearted, fearless, hard-working, and overflowing with love for his family. My father was a blue collar worker who retired from J L Hudson Company after 30 years of employment there. He explained to us children that he was Santa’s helper, preparing all the presents for shipments all around the world. He was the oldest in a family of six. He was born on December 18, 1925 and died on December 18, 2009. He was married to my mother in 1956. And the only time I ever saw tears flow from my father’s eyes was when my mother passed away in 1989. We were lucky to have my father in our lives for 84 years. And we were lucky to all be with him as he took his last breath. I remember so much about my father. He would work hard at his job, leaving for work early in the morning and returning from work only to come home and spend quality time with me and my siblings. His commute to work required taking a bus before he could afford a car. And I don’t remember a single day where he came home frustrated or too tired to spend time with me. My father was not a rich man by any measure. He worked for an hourly wage in the J L Hudson main warehouse in downtown Detroit and supported a family of seven children and his wife. We lived in Detroit at 9121 Milner . He lived in other places before I was born, including living in the projects for many years as well. Even though my father didn’t have overflowing financial resources we always seemed to have what we needed. Mind you we didn’t have many things we wanted but we always had what we needed. I know that taking care of a family with seven children was financially challenging but my father was never overwhelmed. He was a rock that we depended on and he always came through. My father was a brave soul as well. I remember witnessing him stand between a man who broke down our front door and our family. The man was drunk and armed with a pistol. He was much younger than my father and there was no hesitation. Dad was fast to come between this man and our family to protect us from danger. There is no doubt that my father possessed all the qualities we would see in a modern day hero. Another fact was how generous my father was. In spite of his limited resources he was always VERY generous with his time. He gave of his time to Boy Scouts, Father’s Club, Men’s Club, Parish Council, Fish Club. He was always the first to volunteer. And of course we were volunteered along with him for many events. I remember the paper drives, pancake breakfasts, fish fry’s , spaghetti dinners and other fund raisers, developing a community garden, setting up Christmas decorations at church, and helping with many miscellaneous tasks around the church. My father was also a very creative man. He made thousands of signs and decorations in his days. Most were for church events but many were for family events as well; Happy Birthday, Happy Easter, Congratulations, Merry Christmas, Welcome Home, etc… He also made stained glass ornaments and decorations, trick-or-treat candy collectors out of bleach bottles, origami stars and fish ornaments for the Christmas trees out of plastic tie-downs from skids he unloaded at work. He made countless pins (hearts, four leaf clovers, Santa, Christmas Trees) that he would cut out of roman cleanser bottles. The most precious pin he made was out of wood, recycled from a dilapidated house that the church purchased and demolished to make way for the community garden. A team of three or four men and their sons (me included) worked for weeks to salvage wood, bricks, and miscellaneous materials from that old house. And we collected thousands of pieces of lattice wood (the wood inside the old plastered walls). Out of those old dead tree parts he cut tiny (3/4 inch) wooden crucifixes using his old jig saw that Fr. Zerafa gave him. He then carefully glued a gold pin into a small hand carved crevice in the back of the crucifix. And thousands of people received these crucifixes at Good Friday services. My dad was a master repurpose craftsman, a true artist. Where most people saw trash, he saw treasures. And he patiently recreated the bleach bottles, cardboard, plastic cargo straps, paper, computer cards, and old-wood into thousands upon thousands of inventions. Not only did he make wonderful things with his hands, my father was a master story teller. We would sit with him on summer evenings on our porch. On an old green glider that was repaired at least 20 different times. And he would tell stories that kept us captivated from beginning to the end. I remember that even our neighbor friends would set and listen to his stories. There were at least four or five sets of eager ears carefully listening as he made wonderful characters come to life in our minds. We would also ask for another story in an attempt to delay our bedtime. If we had captured his stories and compiled them into a book I believe they would have filled thousands of pages and that book would have been a best seller. My father always admired and loved Walt Disney and I wish he had somehow connected with Walt. If he managed to do that I believe that some of his stories may have become classic animated shows as well. But unfortunately these stories were meant for our ears and I couldn’t even come close to telling them like he did. And then it was revealed to me. My father was like the little drummer boy. He didn’t have the finest gifts to bring before a king. He couldn’t afford Gold, Frankincense and Myrrh. But what he did have, he gave. Every talent he was given was used to give to others. He mixed the Love he had overflowing in his heart into these creations and brought joy to many people along the way. The Nativity church prepared for Christmas early in 2009, in honor of my father. Christmas trees and poinsettia’s and the baby Jesus decorated the beautiful alter for his funeral mass. The piano and snare drum started the song and then my talented and beautiful son sang the lyrics with an angelic voice; “Come they told me pa rum pump um pum…” This was a very beautiful tribute to my father. And I couldn’t help but notice the little baby Jesus smile. And my father always told me that Heaven was only a smile away. So I knew where my father was and there was peace in my heart. 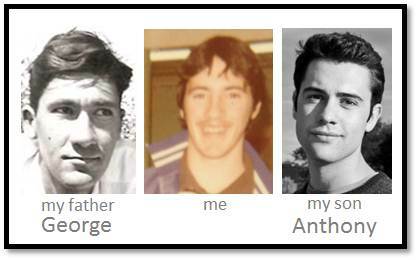 So why am I telling you my father’s story? I mentioned wanting to talk more about a transformation experience as I fight this cancer battle. Well, I believe my Father’s story gives insight and context to what is occurring inside of my heart. As a stage IV colon cancer survivor I have to face scary statistics. One published statistic is that only 5% of Stage IV colon cancer survivor’s live beyond five years after diagnosis. Keep in mind it’s been two years now. Even though this statistic is published by reputable sources we have to keep in mind that most Stage IV Colon Cancer victims are much older than 49. And they commonly suffer from other ailments as well. As previously mentioned in another blog entry; there are many Stage IV survivors that are in remission for many years as well. And if it is God’s will than I will be around for a long time. I will talk more about this in future posts, but for now I have rambled on enough. So I will draw to a close this update with a reference to lyrics from another song (by the Zack Brown band). We found my father in his house, on his last days, with his drum in his hand! He lived his life given to others; everything he had to give. And I personally saw Baby Jesus smile at him! I hope that I will sing the song that I’ve been given to sing! I pray that I will sing it until the very end. And I pray that it will make Baby Jesus smile on me as well. Thank you for reading my blog and sending me so many encouraging comments and supportive notes. God be with each and every one of you today, tomorrow, and beyond! One more treatment to go!!! !